With its sleek construction and high-efficiency, the Airwasher is the most powerful 2-in-1 humidifier and purifier on the market today. Every Venta Airwasher incorporates our revolutionary Cold-Water Evaporation technology and operates with a whisper-quiet, multi-speed motor, putting the perfect amount of humidity in the air without white dust or mold. Simultaneously, the Airwasher removes airborne pollutants like odours, allergens, dust and dander from the air without the use of filters. With no danger of over-humidification, the Airwasher is designed to run 24/7 giving you year-round perfect indoor air quality. Whether you choose an LW15, LW25 or LW45 Airwasher, rest assured that each model is fully recyclable and is manufactured in a facility powered entirely by wind energy. Ideal for spaces up to 200 sq.ft. With the NEW AeraMax Professional with PureView technology, the invisible becomes visible. The PureView screen shows the status of the current room air quality including percentage of particles captured and removed from the air. The display shows PM 2.5 and PM 10 air quality readings. Machine performance is regulated by EnviroSmart 2.0 which includes dual self-regulating laser particle counters, VOC, audio and motion sensors. Screen also displays VOC/odor levels, filter replacement life and reorder information. It also allows brightness adjustment or to be placed in standby or turned off. This Space-Saver humidifier from AIRCARE is sure to complement any decor. Our humidifiers work by adding invisible moisture to your environment by moving dry air through a saturated wick. Maintaining proper humidity levels between 30-50% in your home/office/workplace has been scientifically proven to help prevent the flu and allergies. Proper humidity hydrates your skin, alleviates dry eyes, scratchy throats and can reduce snoring. With a doctor's approval, increased humidity can reduce asthma and allergy symptoms. It also protects fine furniture, musical instruments, collectibles and wood floors. Proper humidity makes you feel warmer allowing you to lower your thermostat setting which will save money. This unit uses a 1043CN filter wick. Creating a better home environment. The Air Cleaning System is more than just a filter. Multiple levels of cleaning include HEPA, UV-C and charcoal to help improve indoor air quality. Why UV-C Light Technology? Hospitals use UV-C light to sanitize. UV-C light is proven to kill germs on surfaces, and in the air and water. It is highly effective at penetrating thin walled germs and bacteria and altering their genetic structure so they die. Why True HEPA Filtration? Common household allergens can trigger an allergy or asthma attack. HEPA filters trap 99.97% of particles down to .3 microns in size, reducing the airborne allergens in your home. 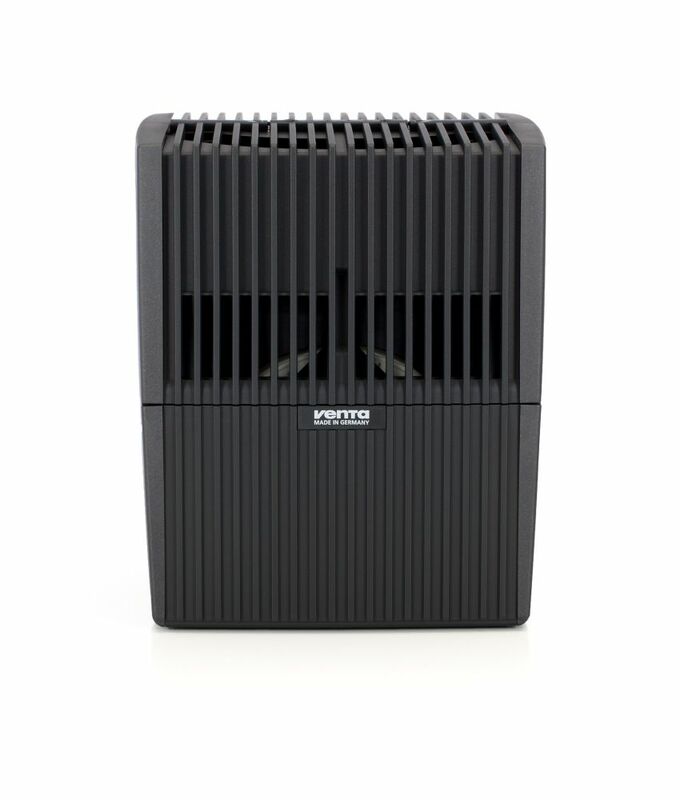 2-in-1 Evaporative Humidifier and Air Purifier With its sleek construction and high-efficiency, the Airwasher is the most powerful 2-in-1 humidifier and purifier on the market today. Every Venta Airwasher incorporates our revolutionary Cold-Water Evaporation technology and operates with a whisper-quiet, multi-speed motor, putting the perfect amount of humidity in the air without white dust or mold. Simultaneously, the Airwasher removes airborne pollutants like odours, allergens, dust and dander from the air without the use of filters. With no danger of over-humidification, the Airwasher is designed to run 24/7 giving you year-round perfect indoor air quality. Whether you choose an LW15, LW25 or LW45 Airwasher, rest assured that each model is fully recyclable and is manufactured in a facility powered entirely by wind energy. 2-in-1 Evaporative Humidifier and Air Purifier is rated 4.7 out of 5 by 7. Rated 5 out of 5 by Ursla from It is working very well.... It is working very well. Rated 4 out of 5 by Dave from guarantee ? Nice unit ; considering the price I was not happy when I was asked to submit the serial number for the guarantee and found that that number was buried under a sticker which could not be removed , inside the upper body ; not good. I suppose that in the unlikely event that the unit self destructs , that I will be out of luck .. Rated 5 out of 5 by Donald from It is everything it says it was to be: quiet,... It is everything it says it was to be: quiet, energy efficient, uniform, stable humidity, and easy to manage. Rated 4 out of 5 by CC from Easy to use. Works very good . Easy to use. Works very good . Rated 5 out of 5 by Gangsu from Doing the job. I bought the smallest model to set beneath the piano and it’s doing a decent job maintaining reasonable humidity levels in the immediate vicinity - between 32 and 38%. Bonus that there is zero draft at my feet while sitting at the piano, even though its sending 3+ litres of water into the air every day. Whisper quiet. Easy to clean. I like the fact that it’s not hardwired. The power cable has an 1/8” connector. You could conceivably set the unit in the middle of the room and feed the cable through the floor to an outlet in the basement. Expensive but I’d buy it again. Tired of throwing away units that cannot be thoroughly cleaned. Rated 5 out of 5 by gardenguy7 from This newer Venta Airwasher LW15 is every bit as effective in our bedroom as the LW25 is in our li... This newer Venta Airwasher LW15 is every bit as effective in our bedroom as the LW25 is in our living room. We couldn't be happier with our purchase. The ease of use and cleaning is such a change from other humidifiers we have bought in the past, but the effect on our air quality is the most important feature. What's not to like?We have used the larger model for 4-5 months, and the smaller one for a month, and both more than meet expectations! No more dry skin and nasal passages or daily fits of sneezing, plus we are sleeping more soundly. Love this product!